Welcome to Antiques & Moore! This large Art Glass dresser box features a frosted acid textured background with cameo cut cranberry glass flowers, foliage and swags on a Vaseline glass body, c. The glass does fluoresce under black light and contrasts beautifully with the cranberry glass cameo style design standing in relief and embellished with gilding. The acid etched background has a crystalized ice texture. The Sterling Silver lid has a beaded decoration inside the upper rim and around the lower edge and has a lovely engraved 3-letter monogram "H D W" in center top. This type cameo glass was also produced by Val St. Louis, however, since the Sterling Silver lid was made by an American company, we believe Honesdale was the maker. The Honesdale Company of Honesdale PA was originally founded to decorate glass for the Dorflinger firm, however, in 1918 they were decorating glass for other companies and the factory closed in 1932. Measures 2 3/4" high with a 4 5/8" diameter top and 4 1/2 diameter base. Weighs just over 1 pound. This stunning box is in excellent Estate condition with no noted flaws and reflecting only minimal signs of normal wear with minor scratching on base. We at Antiques & Moore have been in the Antiques business for over 30 years and try to describe our items as accurately as possible. We are happy to answer any questions and always appreciate your business! The item "Honesdale Cameo Style Dresser / Powder Box, Sterling Silver Lid, c. 1900" is in sale since Tuesday, April 17, 2018. 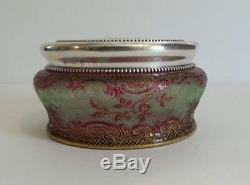 This item is in the category "Pottery & Glass\Glass\Art Glass\French\Other French Art Glass". The seller is "antiquesandmooresales" and is located in Hendersonville, North Carolina.